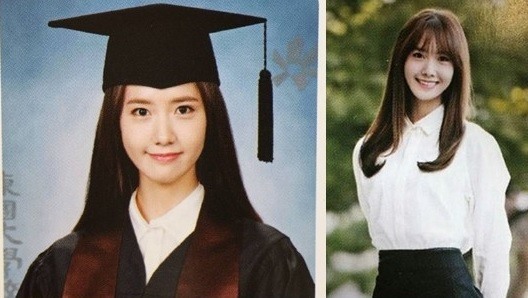 Yoona, a member of K-pop group Girls’ Generation, will receive a lifetime achievement award from her university at its graduation ceremony on Tuesday. The 24-year-old idol will receive the award as well as a graduate diploma in theater studies from Dongguk University after six years of study. The singer-actress was accepted to the school in 2009 through a special selection process for her talent in acting. Sunye, a member of the group Wonder Girls, was admitted to the school at the same time. The award will be given to Yoona in recognition of her exemplary activities and contributions to Dongguk University, the school said. Meanwhile, Yoona is currently acting in the upcoming Chinese TV series “God of War Zhao Yun,” scheduled to begin airing on China’s Hunan TV in August.